CTLA-4 Inhibition of B7-1/CD80-induced IL-2 Secretion and Neutralization by Mouse CTLA-4 Antibody. 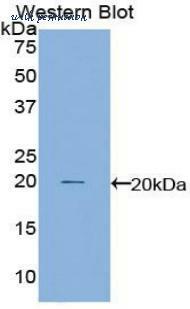 Recombinant Mouse CTLA-4 Fc Chimera (Catalog # 434-CT ) inhibits Recombinant Human B7-1/CD80 Fc Chimera (Catalog # 140-B1 ) induced IL-2 secretion in the Jurkat human acute T cell leukemia cell line in a dose-dependent manner (orange line), as measured by the Human IL-2 Quantikine ELISA Kit (Catalog # D2050 ). 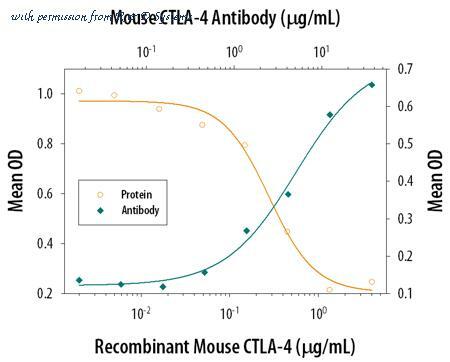 Inhibition of Recombinant Human B7-1/CD80 Fc Chimera (3 ╡g/mL) activity elicited by Recombinant Mouse CTLA-4 Fc Chimera (1 ╡g/mL) is neutralized (green line) by increasing concentrations of Mouse CTLA-4 Monoclonal Antibody (Catalog # MAB434). The ND50 is typically 2.5-10 ╡g/mL in the presence of PHA (10 ╡g/mL). 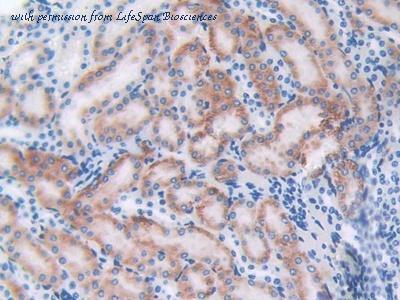 Immunohistochemical staining of Human Liver Cancer tissue using CTLA4 antibody. Immunohistochemical staining of Mouse Colon Tissue using CTLA4 antibody. 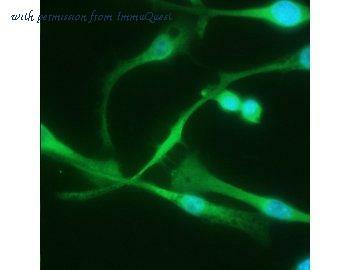 Immunohistochemical staining of Mouse Tumor Tissue using CTLA4 antibody. Western blot of recombinant CTLA4 / CD152. This image was taken for the unconjugated form of this product. Other forms have not been tested.